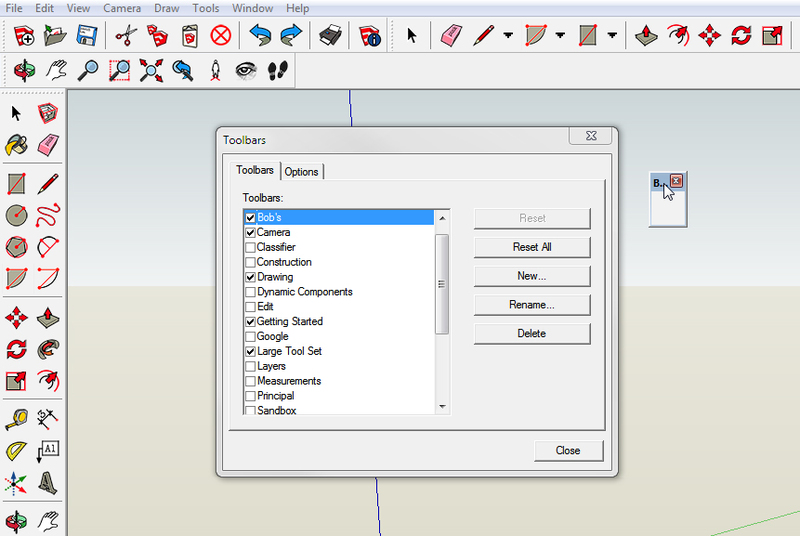 Select “Toolbars” from the View Menu to display and make a custom toolbar. Drag tools from where they are to your custom toolbar. Go to the View menu and select “Toolbars”. This window will appear, and you can check or uncheck the toolbars that come with SketchUp. You can then drag the toolbars to the top or side of your screen and dock them. As they say on TV, “But wait! There’s more!”. One of the buttons on the right is labeled “New” and if you click on that an empty toolbar appears. You can then drag individual tool buttons from the bars they live on to your new toolbar. You can also remove buttons you never use by dragging them off a toolbar and into your modeling space. So far, so good, but that changes the appearance of the supplied toolbars. If you want to keep them, click on the button that says “Reset All”. That returns the buttons to where they were without affecting your custom toolbar. The “Large Tool Set” toolbar was a bit quirky in SketchUp 2013, it now behaves itself and will display as a double column when docked on the left side to the screen. If you have a sharp eye, you will notice that some of the drawing tools (as seen on the “Getting Started” toolbar) have black arrows that point down next to the icons. Click on the arrow and a flyout appears that will let you access some additional tools. The Circle and Polygon tools are now behind the Rectangle tool, the Freehand tool is now behind the Pencil. I like this feature because it streamlines the toolbars with the most often used tools up front and ready to go. 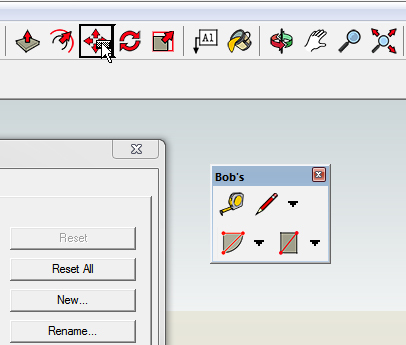 Many beginning SketchUp users get lost in the abundance of icons on screen. In my example of creating a custom toolbar, these are the icons I used. I use and highly recommend keyboard shortcuts for most commands (you can download a free pdf of my favorites here) but it is helpful to have your toolbars organized to meet your needs. The Arc tool also has a drop down, with new ways to draw arcs. 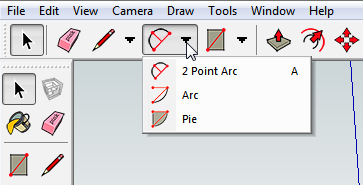 I like the original way SketchUp makes arcs, but these new options are a worthy addition. There is enough going on with the Arc tool that it deserves a post of its own. There are also several other posts about the latest edition of SketchUp, you can read them at this link. I bought your book Woodworkers Guide to Sketchup and found it very helpful. I am getting very familiar with the tools and have started to draw projects. In this blog you mention add-ons and getting them from the Extension Wharehouse. What add- ons have you downloaded? At what stage in learning Sketchup did you see the need for add-ons? Are there any that you would recommend? I really appreciate the article, and it has proven quite helpful for knowing how to customize my tool bars. However, I’m still stuck with tool menus that remain off screen. On my work machine it’s not a problem because it’s a dual display system. Whenever I load a new tool set, the menu appears on the other screen and I just have to move it into place. On my home system however, I’ve only one screen. When I check in Window >Preferences >Extensions, Thea Render for SketchUp & vfs extensions are ticked but invisible. Along with a few others. How do I get them on screen? Got to the View Menu and select Toobars. The extension toolbars ought to be in the list under the Toolbars tab.